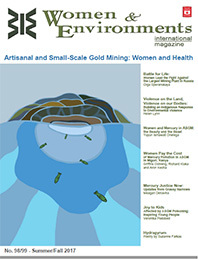 Women & Environments International (WEI) is a unique Canadian magazine, which examines women's multiple relations to their environments - natural, built and social - from feminist and anti-racist perspectives. It has provided a forum for academic research and theory, professional practice and community experience since 1976. Produced by a volunteer Editorial Board, the magazine contributes to feminist social change. WEI Magazine is proud to give a big congratulations to our board member Olga Speranskaya for receiving the Goldman Environmental Prize! The Prize recognizes individuals for sustained and significant efforts to protect and enhance the natural environment. Scientist Olga Speranskaya successfully transformed the NGO community in Eastern Europe, the Caucasus and Central Asia (EECCA) into a potent, participatory force working to identify and eliminate the Soviet legacy of toxic chemicals in the environment. To learn more about the Goldman Environmental Prize and Olga's work visit www.goldmanprize.org.